Just click on the sun, any of the planets, an asteroid or a comet to find more information. From Kids Astronomy. Loads of earth and solar system science experiments, such as gelatin volcanoes, alka seltzer rockets. In this activity, you’ll learn how to build a simple pinhole viewer. This apparatus can be used to project images from a variety of light sources. When used to project an image of the Sun, the pinhole viewer can be used to determine the diameter of Sun. Galileo did not invent the telescope, but he was the first to use the telescope to study the heavens systematically. He discovered the moons of Jupiter, proved Copernicus’ solar system model was correct, and while observing sunspots concluded the sun revolved, heretical notions in his day. A set of lesson plans with projects for young students. Print out and enjoy. Learn about Northern lights and solar sprites and storms. Explore the earth’s magnetic field. Using the “clue cards” and printouts of the planets provided, you’ll learn about the order of planets in our solar system. Hi! I’m Eddy the Eco-Dog®! I’m from Planet Chachachawowa and I surf through the universe. Which planet are you from? Our solar system consists of the sun, eight planets, moons, many dwarf planets (or plutoids), an asteroid belt, comets, meteors, and others. Page is loaded with graphics, graphs, charts and worksheets. In this activity, using planet printouts provided, you’ll investigate the concepts of relative size and distance by creating a basic model of our solar system. A solar eclipse is one of the most dramatic astronomical events it is possible to witness. They are caused by the shadow of the moon falling on the Earth. 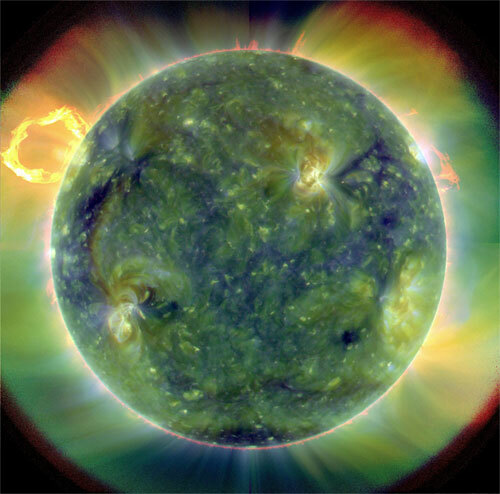 Major solar flare eruption June 7, 2011. In the video Dr. Young explains what is happening. Interactive solar system exploration site from NASA. Click on a solar object to find more information. Select your favorite planet, the sun, asteroids or comets to color online or print and color offline. See how the planets arranged themselves on any day of any year. An “adjustable” solar system. This website is an overview of the history, mythology, and current scientific knowledge of the planets, moons and other objects in our solar system. Think you can verify Venus and peg Pluto? Give it your best shot online. Trading cards to print out and play a game offline. Just enter your weight and this site calculates how much you would weigh under the gravity on all the other planets. To intercept eclipse, Alaska Airlines adjusts flight plan to delight astronomers. About a year ago, Rao discovered that Alaska Airlines Flight 870 from Anchorage to Honolulu would intersect the “path of totality” – the darkest shadow of the moon as it passes over the Earth. But the flight’s normally scheduled departure time would have been 25 minutes too early, missing the grand spectacle. Rather than attempt to move the sun or the moon or the Earth, Rao called Alaska Airlines. Alaska decided to move the plane. NASA’s recently launched Solar Dynamics Observatory, or SDO, is returning early images that confirm an unprecedented new capability for scientists to better understand our sun’s dynamic processes. These solar activities affect everything on Earth. Without the sun, life as we see it today could not exist. Maybe that is why humans have looked to the sun as an inspiration; a symbol of hope and new beginnings. We study it, tell stories about it, and wonder about this critical part of our solar system. The Sun is the Power House for the entire Solar System. It is a fairly typical star that is not burning, but is fusing together Hydrogen to form Helium. In so doing, it releases energy in vast quantities. This real-time movie, which shows the most recent 48 hours of solar activity, is updated every hour if satellite communications permit. Students can explore the Sun’s tangled magnetic field, its turbulent surface motions, the dramatic sunspot cycle, and even what magic happens in the solar interior where instrumental eyes cannot penetrate. With this activity you can verify that the Sun appears in a different location at a specific time every day of the year with one exception. Experiments to discover more about our earth. Get a deeper understanding of the moon with these resources for a unit study about The Moon. Videos, maps, history of discoveries: Neil Armstrong, included. Unit study based around all the excitement of the Mars Landers. NASA’s Goal: Understand origin and evolution of Jupiter, look for solid planetary core, map magnetic field, measure water and ammonia in deep atmosphere, observe auroras. Hey, kids! My name is Cassini and along with my buddy Huygens, I’m on my way to explore the planet Saturn. Welcome to command central for this spectacular journey. NASA’s Cassini mission lifted off on October 15, 1997, and arrived at Saturn in June 2004, where it will explore of the planet, its giant moon Titan, and several of its smaller moons. Almost everything we know today about the beautiful giant ringed planet comes from Cassini, the NASA mission that launched in 1997 and arrived at Saturn in 2004. Since then, the spacecraft has been beaming home miraculous images and scientific data, revealing countless wonders about the planet, its rings, and 62 moons—including some that could harbor life. As the mission approaches its final days in 2017, it attempts one last set of daring maneuvers—diving between the innermost ring and the top of Saturn’s atmosphere. Aiming to skim less than 2,000 miles above the cloud tops, no spacecraft has ever gone so close to Saturn and hopes are high for incredible observations that could solve major mysteries about the planet’s core. But such a daring maneuver comes with many risks. Join NASA engineers for the tense and triumphant moments as they find out if their gambit has paid off, and discover the wonders that Cassini has revealed over the years. The sixth (and some would say prettiest) planet in the solar system. The planet is mostly hydrogen and helium, but the rings are made of little chunks of ice. The dark line in the rings is a gap called the Cassini Division, swept clear of ice chunks by the periodic gravitational tugging of a moon, Mimas, which is in orbital resonance with anything in that gap. Kids Astronomy. Everyone has one too many old CD’s around the house! Here’s how to turn it into a glistening model of Saturn to hang in your room. Find out more about Saturn. On July 15, 2015 the NASA “New Horizon” probe did a close flyby with much data recorded that will be sent for the 5.5 hour journey back to earth for analysis and distribution. Hail King of the Ice Dwarfs! For a long time, scientists have been trying to decide how to define the word “planet.” If Pluto is a “planet,” many other recently discovered objects nearly as large would also be planets. There is no telling how many “planets” kids would have to memorize someday! Pluto is smaller than 7 of the moons in the Solar System. Because it is so small many scientists don’t consider it a planet at all. Pluto is named for the Roman god of the underworld. Venetia Burney, an 11-year-old girl from Oxford, England, suggested the name. If you need some number facts about Pluto, you’ll find them here. This new dwarf planet is the largest object found in orbit around the sun since the discovery of Neptune and its moon Triton in 1846. It is larger than Pluto, discovered in 1930.